Welcome to our beloved staging room for our family education! I love our school room - so much. Technically, it's the dining room but I don't see us using a formal dining room for many years to come. It's just not my style. Meet me in the kitchen - that's where I prefer to eat and chat. We schooled at home for years without a dedicated school room and that has made me so grateful to have one now. 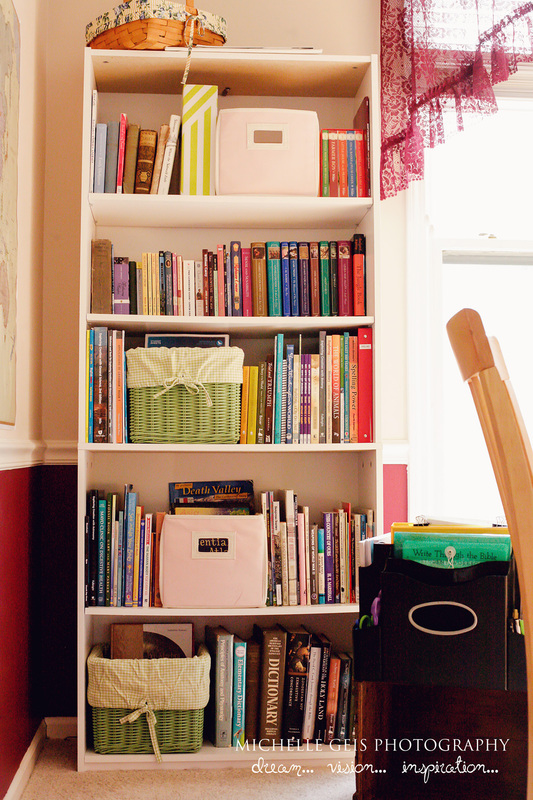 We don't spend much of our time learning in this room, but it does at least provide us with organizational space to house our beloved learning materials. 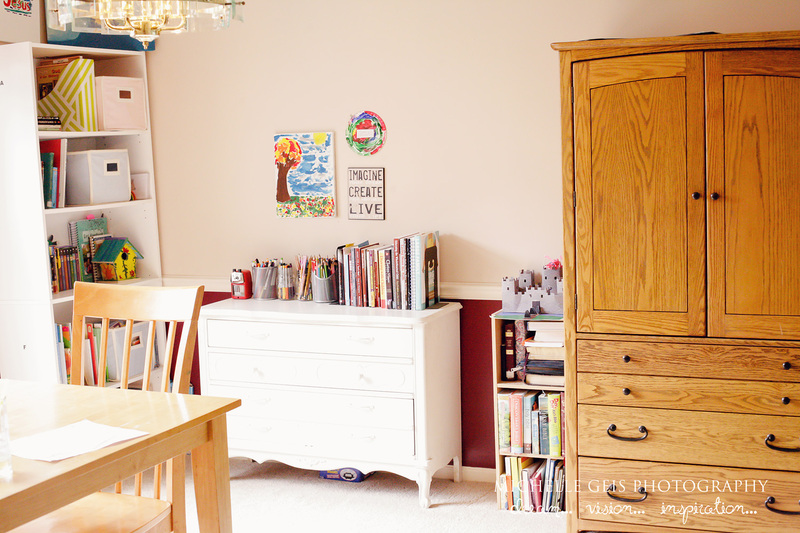 The white dresser holds our puzzles and family games. On top is a few of my favorite books, plus my favorite library references - Honey For A Child's Heart. The tiny book shelf with a castle on top holds our collection of Bibles, including some family Bibles. And above the dresser we will display a few favorite art work pieces made by the children. 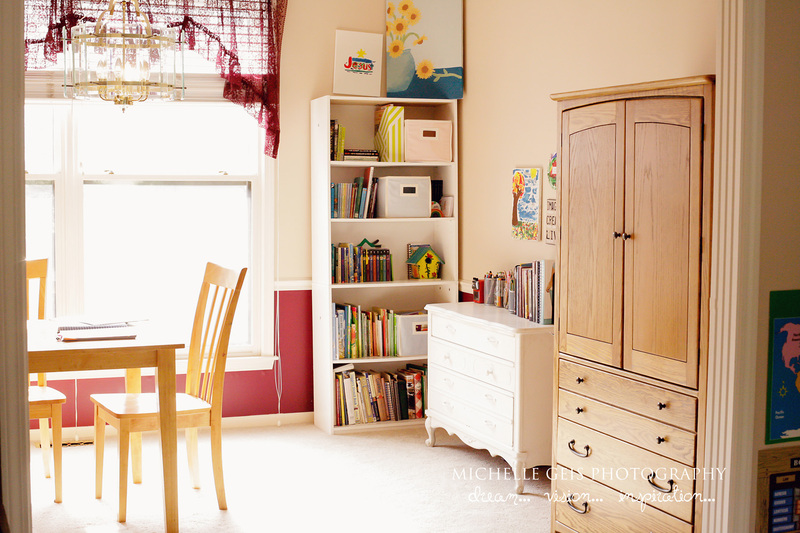 The book shelf in the corner holds a row of current favorite books for each of my children. Any books that don't fit here are stashed downstairs on overflow shelves. 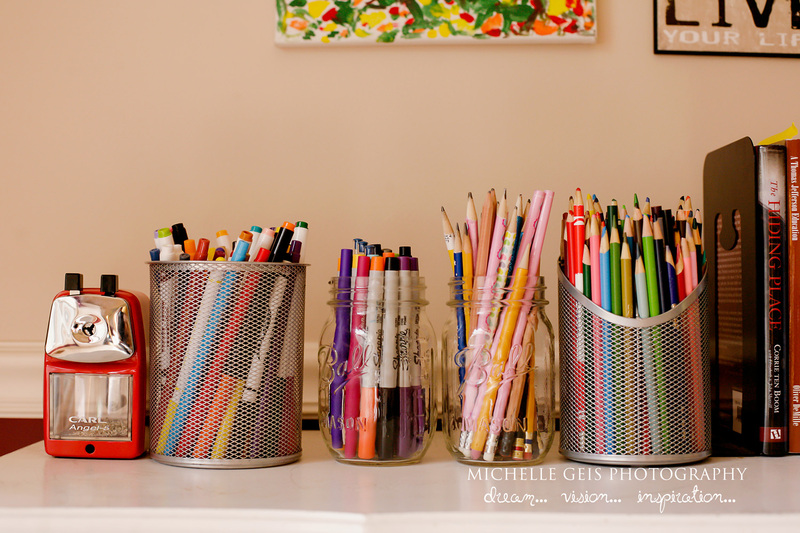 Pencils, colored pencils, markers, and extra fine markers all standing at ready. Easy to find, easy to put away - which is most important. I love having some covered storage. This armoire holds a plethora of supplies. On the bottom shelf is our accumulation of math manipulaitves. The upright binder in the middle contains our favorite pieces of artwork the children have made over the years. I try to keep a few pieces from each school year. And then the paper stacker holds printer paper, lined paper and graphing paper. Up on the top row is our office supplies in a wooden box, colored paper, and some fun animal information cards that belonged to my husband when he was a child. 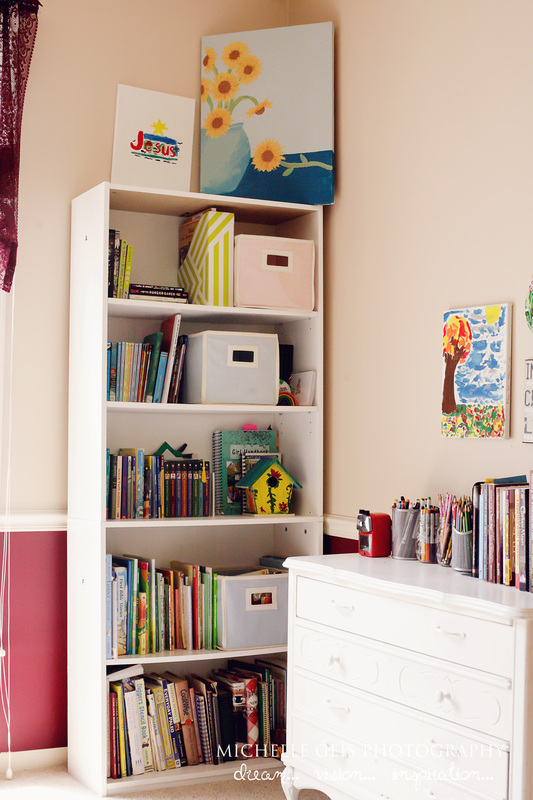 The three drawers below contain extra school supplies and all our most used art supplies: paints, paint smocks, oil pastels, chalk pastels, charcoals, large markers, crayons, watercolor paper and multimedia paper. I absolutely love having a large wall map. 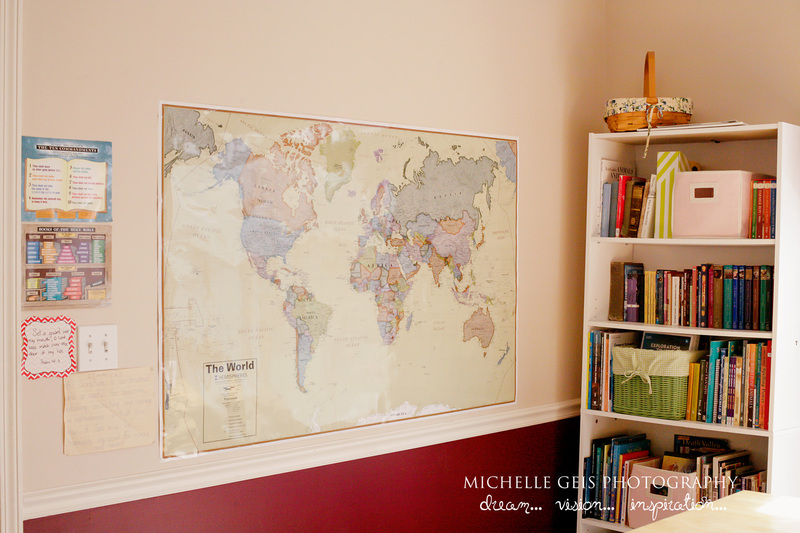 This room is home to the world view map. I have a US map in the 'formal sitting room' - there is nothing formal in my home, by the way. This book shelf is home to our curriculum recommended books, reference books, history and science books, classics that I need to read this year, our favorite poetry and dictionaries. This is where I sit and plan and drink coffee. And knit. I've learned that I am much better off picking up some yarn and a hook or needles and just park myself here during "morning school hours" so that I am always available when needed. If I start working in the kitchen, doing chores, reading, or surfing on my phone I invariably end up asking my kids to "Wait just a minute while I finish..." and then we never finish school on time. So I am planning to get lots of yarn work done this fall. It's not always possible and it seems like such a time waste to just sit there for the morning hours. I always think I will be more productive if I can get up and run to switch the laundry and run to read one more chapter, etc. But that multitasking is actually counter-productive for me. It's HARD to sit there all morning and yarn helps. I can knit, talk, teach, soothe, love, hug, correct all at the same time. But if I get sucked into chores or reading then that time becomes about ME finishing a task/chapter instead of me teaching and inspiring them. As my youngest two grow, this will no longer be true. For right now, this is my spot. That little round about caddy - I *love* that thing - it's from Staples. It's huge - which is good and bad. It blocks the walk way between the table and the bookshelf, but it is worth it. 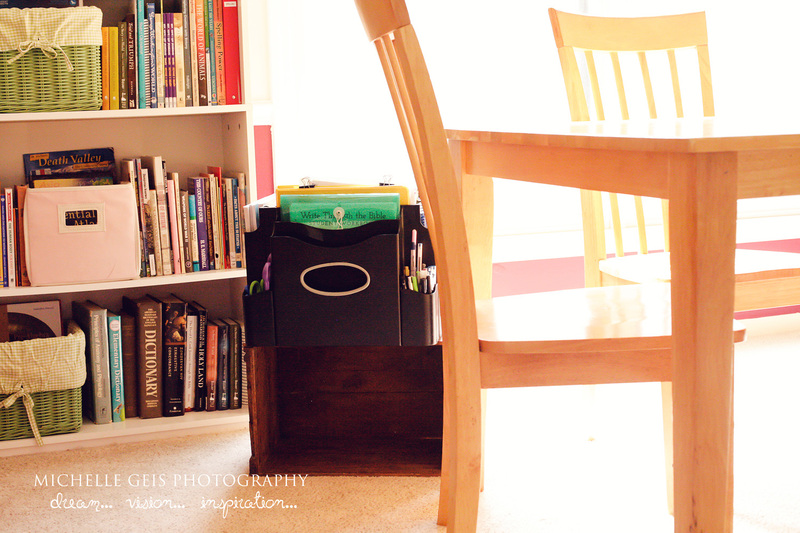 When it's time to switch subjects or grab my planner and my hands are tied with the yarn that I use the tie myself to that chair, most of what I need is at my finger tips. 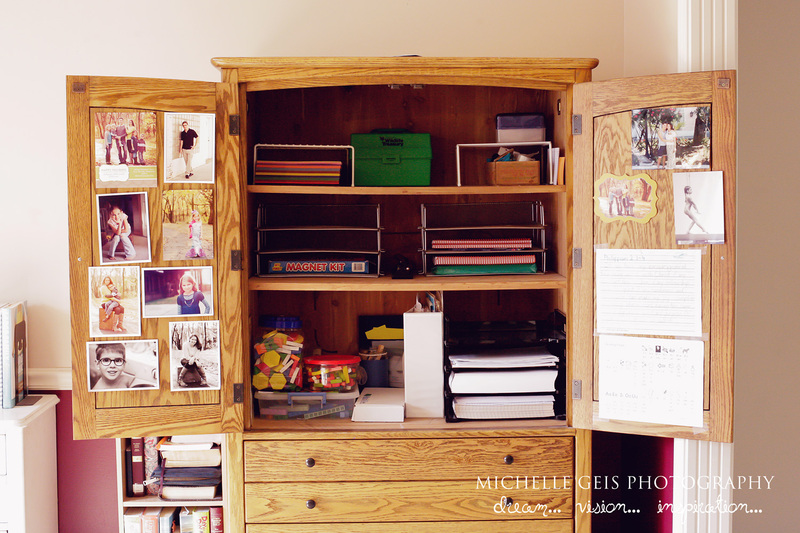 This section is where we file our completed work and where the school room diffuser is stationed. It often comes to the school table during work times (especially when I'm sitting there), but otherwise it diffuses here. I love using Cedarwood and Orange during school time. Peace and Calming when someone is feeling stressed, Purification and Lavender when anyone is not feeling the best. Often the children will mix their own blends and start it up before I even get around to it. I will be keeping a stash of favorite Young Living oils right on this counter behind the diffuser. They really do work and they keep school flowing well. I use that wall space to rotate through work from our favorite artists. This little station is set up in the adjoining room for my youngest. She just likes having her own Mommy-Daughter spot. And she needs to finish up the last bit of first grade before joining her older siblings in Exploration to 1850, this spot will be where we work together. 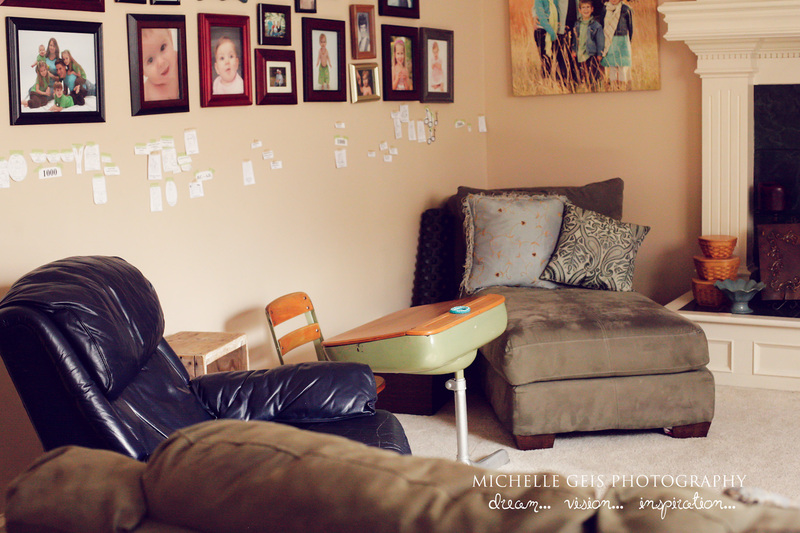 The family room - this is where read-alouds, strategy games and math usually take place. Although my oldest usually prefers to do her math in her room early in the morning before anyone else is awake. I love having our on-going time line that we add to year after year. It's not exactly... aesthetically pleasing. If anyone has a better idea for me, I would love to hear it. Please comment and let me know! 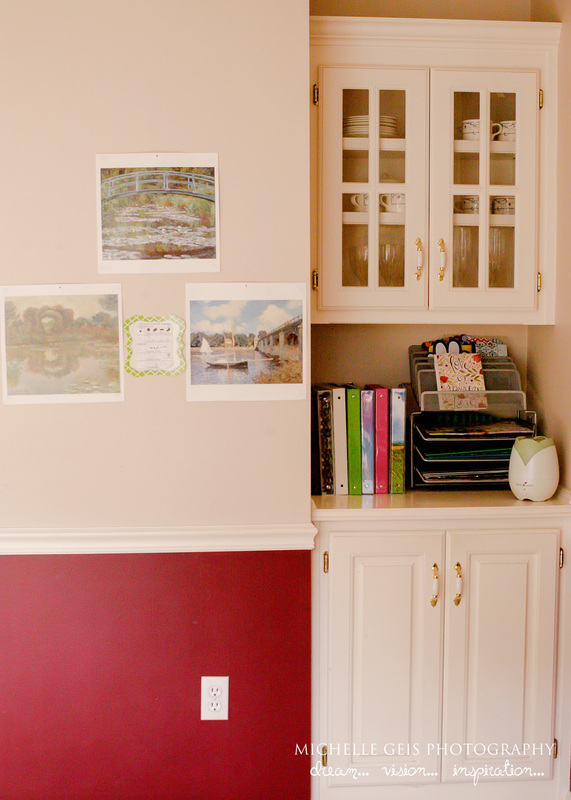 I was wondering about running something like a wallpaper border around the room after we paint - or maybe even putting up a wide chair-rail like trim? I don't know. Hanging frames level and room decor is not my strength. I doubt any frames will stay level regardless of how carefully they are hung when the living room is used like a gymnasium most days. And this would be why I call our school room a staging area. Because no matter how cute your desks or how perfect your tables are, sometimes they learn best by finding their own little spots. Learning happens everywhere in our home. 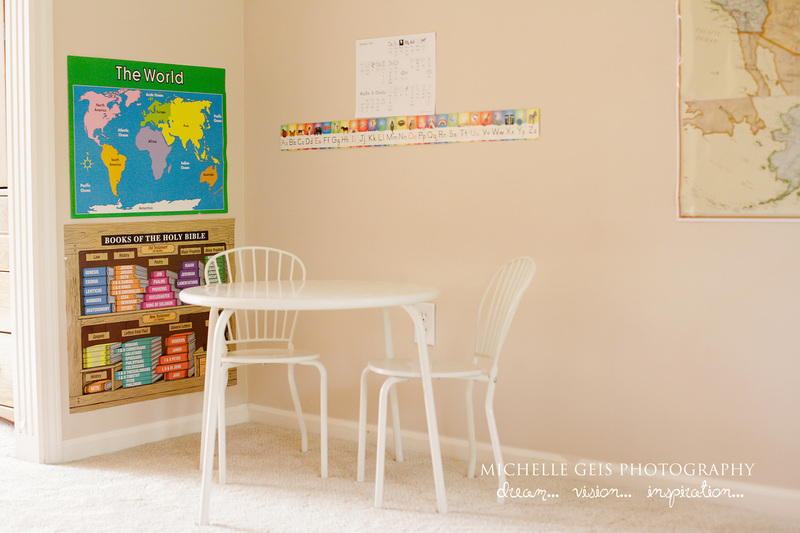 Found your blog while searching MFW... looks like we have lots in common - 4 kids, homeschooling with MFW, allergies, essential oils... great blog... love reading abt all things MFW and organization. Thank you for stopping by and taking the time to comment. We love MFW. I too find that if I leave their line of sight they immediately need help or have a question or start to get sidetracked. Yeah, I hear the load of laundry calling my name and that unfinished book, but in reality it all gets done faster if I just stay there ... even more so if one kid is on my lap. Seems to be the cure all for actually remembering and completing things they don't care for. 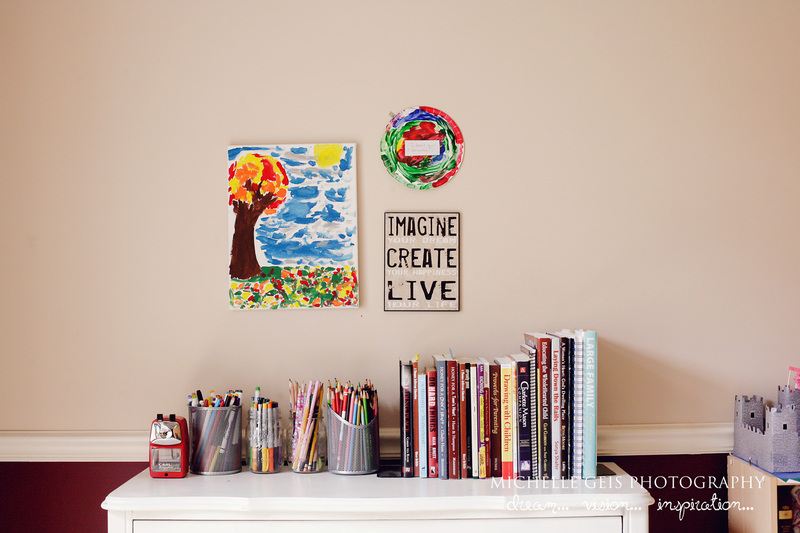 LOVE everything about your school room/area. Huzzah to your new year!